A delicious, skinny dinner salad with a dressing that doubles as a marinade! 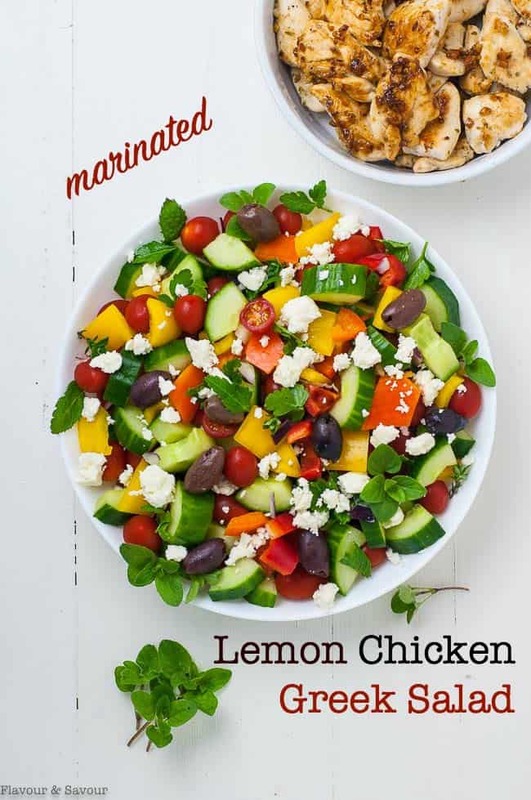 Double the recipe for this Marinated Lemon Chicken Greek Salad with Mint and you’ll have lunch for tomorrow! This is a salad that I could probably eat every day. Lots of colourful, crisp and crunchy veggies, juicy lemon chicken and Mediterranean herbs that seem to make whatever they touch taste exciting. It’s a Greek classic you can make at home. Are you on Team Lettuce or Team No Lettuce? 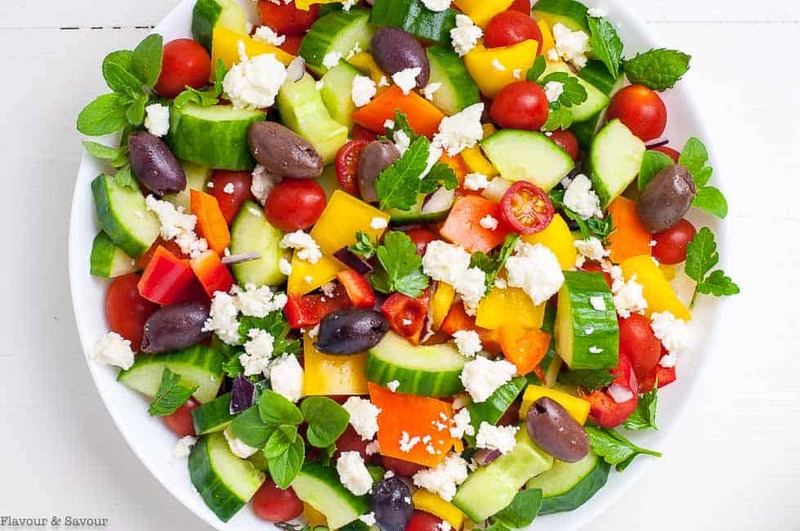 I could join either one, as long as the lettuce is crisp romaine, but today I decided to make a traditional Greek salad with cucumber, peppers, tomatoes, olives, red onion and feta cheese. When I discovered oregano, thyme and mint sprouting in the garden, I knew I wanted to add those, too. Dinner salads have become the norm here at home, now that the weather is improving, the deck furniture is back outside and we’re dreaming of warm summer days. Having a nutritious salad with some lean protein like chicken or fish is my favourite way to eat in the spring and summer. I designed this recipe to be efficient. All you need is one marinade that doubles as a dressing (when you add a teaspoon of honey to it.) Pour half the marinade ingredients over the chicken and reserve the other half to dress the salad later. 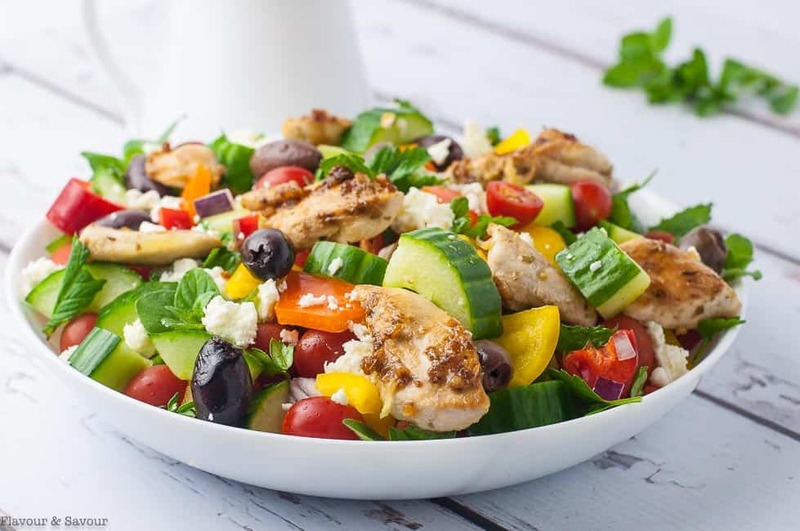 What kind of chicken is best for this Lemon Chicken Greek Salad? I used chicken tenders, but cubed boneless skinless chicken breasts or thighs will work beautifully as well. You can skewer and grill it (remember to soak wooden skewers in advance), or sear it on the stove top and finish it in the oven. If you love Greek chicken with tzatziki sauce, you’ll love this recipe for Greek Lemon Chicken Kabobs with Tzatziki. Can I make this Greek Salad ahead of time? Absolutely! Chop and cover tightly, and store the cooked chicken separately. To keep your salad crisp, be sure to remove the seeds from the cucumber. I use either a small spoon or a melon baller to scrape the length of the cucumber and remove the seeds before slicing and chopping. Feta cheese is traditionally used in a classic Greek Salad. Feta can be made from sheep’s milk, goat milk, a combination of the two, or even from cow’s milk. It’s a soft brined cheese with a tangy taste that can be part of a healthy diet. It’s a good source of calcium and it contains probiotics to help boost our immune system. It can be easier to digest and less inflammatory than cow’s milk cheese. But like any cheese, you may want to eat it sparingly as it is high in sodium and saturated fat. 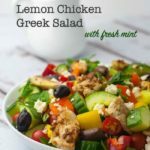 This Lemon Chicken Greek Salad is delicious with cold chicken, too, so make extra to have another day or to add to a rice or quinoa bowl. Don’t forget the mint! A skinny dinner salad with a dressing that doubles as a marinade! Before marinating the chicken, set aside half the marinade to use as dressing. Add a teaspoon of honey to the dressing. 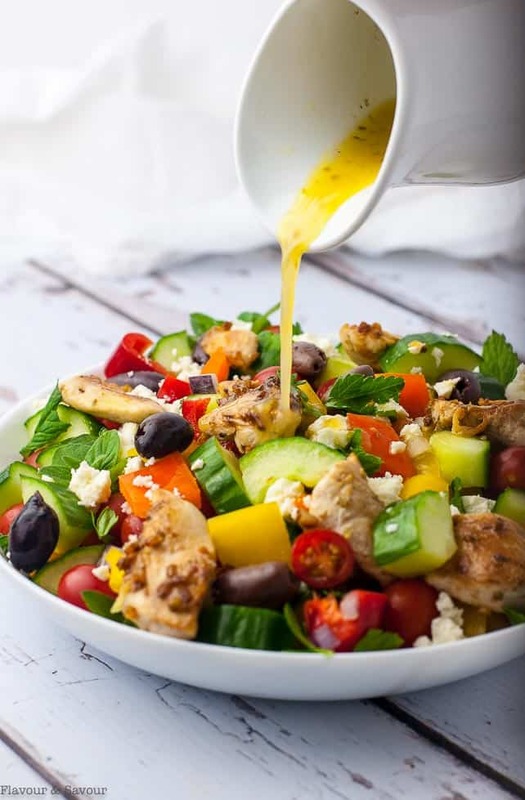 A colourful, crunchy marinated lemon chicken Greek salad with fresh mint and herbs. Whisk marinade ingredients together. Put chicken cubes in a glass bowl or resealable plastic bag and pour HALF the marinade on top. Refrigerate for at least an hour or even overnight. Reserve the other half of the marinade for the dressing. Meanwhile, combine cucumbers, peppers, tomatoes, olives and herbs in a glass serving bowl. Add cooked chicken and garnish with feta cheese. Add 1 teaspoon honey to remaining marinade and use as dressing. Toss together and serve with lemon wedges. *Note that the fat level in the Nutrition label is high because it does not take into account that the marinade used for the chicken will be discarded, not consumed. 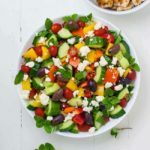 I loved the colors in this salad when I first saw the recipe, but Wow! the flavors are amazing, too. I took it to my sister’s house for dinner last week and it was a hit. Just thought I’d let you know. Thanks so much for letting me know! I love this pretty salad too. It’s great for potlucks.